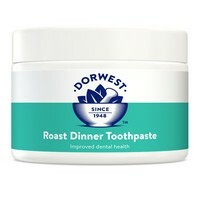 Dorwest Herb's toothpaste is professionally formulated for veterinary use. Animals don’t have their teeth cleaned as often as us, therefore this toothpaste is slightly more abrasive than its human equivalent. It is low foaming and has an acceptable meaty taste to make the whole experience more pleasant for both owner and pet. Roast Dinner Toothpaste contains Sage oil which has antiseptic properties and has the ability to whiten the teeth, freshen the mouth and keep gums healthy. This paste is supplied in a 200g jar, which makes it easier to use than a tube. Apply using a soft toothbrush or a fabric plaster wrapped around your finger, although for smaller dogs a piece of muslin cloth or a cotton bud may be more acceptable. It is not harmful if swallowed but a drink of water after cleaning is advisable. Ideally you should get your pet used to having his teeth cleaned by using it regularly from a young age as part of your general care regime. A good dental hygiene regime with regular cleaning will help improve dental health, and reduce the need for frequent de-scaling of the teeth.